I accidentally deleted this book from my list. What?! This is the perfect book for a person with the desire to start reading biographies. It is organized by subject which is nice because the letters needn't be read in order. Also, it isn't filled with the minutia which can be intimidating to some readers. Each letter is preceded by a brief history about the person writing and the person receiving the letter; the history also provides a backdrop to the letter and offers the reader a glimpse as to why it was written. The subjects included in the book range from topics like money management, family and love. I'm so glad I was introduced to this great book. Another Book Club book. I love David McCullough so I was excited to read something by his daughter. It took me a little while to get into reading a book in letter format--and I did find a few of the letters to be a little boring--but on the whole, I loved it. The letters range from funny, to ironic--Thomas Jefferson lecturing his daughter on the evils of debt--to touching and tragic. A great book. Great mix of past and recent historical figures. Some very surprising insights to people you think you knew. Loved this book. George HW Bush has the best letter near the end. Shows the value of letters and the relationships between great and their children. This is such a great collection of letters. I love writing and receiving letters and believe that it is becoming a lost art. This book demonstrates why it shouldn't. An intriguing peak into the lives of people who had great impact on American culture. I find it interesting that many of these writers are imploring their own children to listen to their advice which is so easily followed in their positions of power or influence. My favorite letters are by George and Barbara Bush and Eddie Rickenbacker. This book was all right. I wish that I could have read a little more about who some of these people are. It was also sad to read some of these letters. My favorite letter was the one that Barbara Bush wrote to her kids. I'm glad that this book ended with that one. Nuggets of wisdom and interesting factoids from history. It’s an anthology, and, as such, the quality is uneven. Each reader will have his or her personal favorites. For me, Ansel Adams to Michael Adams (p. 14) was the most touching. If ever I can write a sentence with so perfect and beautiful an image, then my writing life will be complete: “I am wondering, in the afternoon of my life, just what your day will be.” Not far behind on my scale of enjoyment was N.C. Wyeth to Nat and Caroline Wyeth about his grandson Newell (p. 35). I appreciated the practical wisdom of John D. Rockefeller, William Carlos Williams, Oscar Hammerstein, and a handful of others. In our increasingly post-Christian age, I took special notice of great Americans who chose to write to their children of faith: not “faith” as an amorphous, feel-good, self-improvement technique, but faith in God as revealed in scripture: from Anne Bradstreet, to Jonathan Edwards (of course! ), Daniel Webster, Harriet Beecher Stowe, Anne Bradstreet, Benjamin Rush, Eddie Rickbacker, all the way to Barbara Bush. For me, the letters range from a rare five-star and several four-stars, counterbalanced by several two-star pieces and, every so often, a one-star, so I’ll give the collection three stars overall. 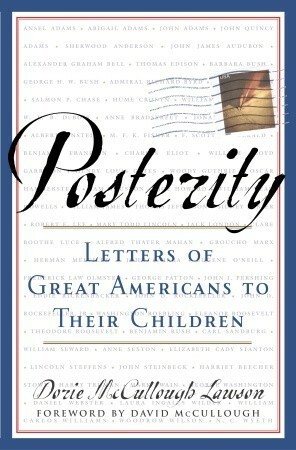 This compilation of letters gives us a glimpse into the hearts and homes of some very public figures. Some of them were wonderful parents, others not so much. Some were very close to their children, others had little contact with them. My impression is that all of these parents, sooner or later, realized their responsibility toward their children, and that the bond between them was precious. Reading these personal letters made me nostalgic for the time when our thoughts were carefully written on a sheet of paper, placed into an envelope, and after the stamp and back of the envelope was licked, placed in the mailbox, all with love. I have saved pretty much every letter anyone has sent to me, and I still take some out to reread. Should I sift through old emails, FB posts, and texts, and store them in an organized digital repository? I'm having a hard enough time keeping up with the photos! Don't get me wrong, I love word processing too much (except for auto-correct 😉) to go back to the old ways, but we always leave some good things behind when we move on. This kind of book is best read slowly, when you have a little time here and a little time there. I read it for book club so felt an urgency to finish is quickly. I don't think it's meant to be read quickly. I didn't know or had never heard of A LOT of these "Great American's" some of them were poets and artist and most of them came from the 1700's and 1800's. The general theme was that these people ADORED their children, even expressing that kind of adoration when they were significantly older. Most of them had very long absences from their children. My favorite letter was from Mark Twain to his 3 year old daughter Susie pretending he was Santa Clause. I will never think of Jack London in a positive light ever again after reading his horrible and verbally abusive letters to his 12 year old daughter basically telling her she needed to choose between him and his "small in every sense of the word" ex-wife. This is a beautiful book that gives a rare glimpse of the lives of great Americans. Just about every subject is raised. Character, money management, aging, family relationships. In short, everything that regular Americans experience. Some of the insights into the lives of these people that surprised me are as follows:*General Pershing lost his wife and three daughters in a fire in 1915 and the only child living was his son Warren whom he chastized about his grades (He was worried he wouldn't make it into West Point). Warren did not make it into West Point but became a stock broker and was the pride of his father's life. *George H.W. Bush has a sense of humor. *The contributions that the Rockifeller Family made to the betterment of the country. Like millions of dollars to create Arcadia National Park in California and the Teton National Park in Wyoming. I really appreciated this book, not only as a unique way to understand American History, but also as a way to introduce young people to using primary sources. And within the history, what you are learning about, is not the events, but rather the people who lived those events. It is a view right into their hearts as individuals. I am a firm believer that history is best looked at in personal way, and this makes it highly personal.This is both a history book and a writing book. These are personal letters of famous people to their families. It would make a terrific compliment if you have been discussing letter writing specifically, or writing in general. I love reading personal writing - letters or journals - and this was a collection of great people. I only read through some of them before my library borrowing time ran out, but want to read more! I just wish they would have included some pictures of the real letters and penmanship. Or, packaged it in a way where one page has a picture of the letter and the other has a transcription. 'It was ok' sums this book up pretty well. It depended a little too much on the letters themselves to carry the whole theme. I rather enjoyed the little introductory paragraphs about each person and the background surrounding the letter. A respectable first book by the daughter of one of America's premier historians, David McCullough. The letters chosen reflect intelligent researching and presentation, and provide inspiration and insight to the challenges faced by parents and their children in all ages. May 2015 Book Club. Some treasures, some duds, nice bedtime book. Keep it by your bed and read a little here & there and then drift off to sleep. Some real gems here. I especially liked the Rockefeller letters, among others. The letters offers lessons in life, love, character, and compasion that surprise and enlighten the reader. I listened to an interview with the author on NPR. She read a letter from Woody Guthrie to his son Arlo and I just sobbed. Gleaned a few insights into the thinking of various historical figures. I especially enjoyed Teddy Roosevelt's letters, which surprised me. And who knew that Jack London was such an SOB (at least to his daughter)? I listened to this book.Not that entertaining but some interesting letters of counsel or comfort written by famous people to their children. This book is a really interesing, an insight into the minds of the men and women who ruled in the old days. A wonderful collection of intimate conversations between historic families. My favorite was Barbara Bush- Keep Trying. My second read and enjoying it even more.